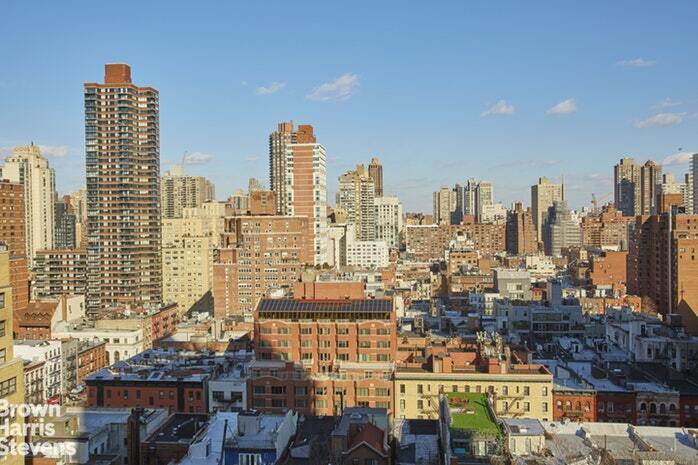 Apt PH20F is a bright, crisp, and clean split 2 bedroom 1 bathroom with gorgeous open views from every room. Freshly painted, this high floor apartment has Northern and Eastern light and cascading picturesque city view with no obstructions. 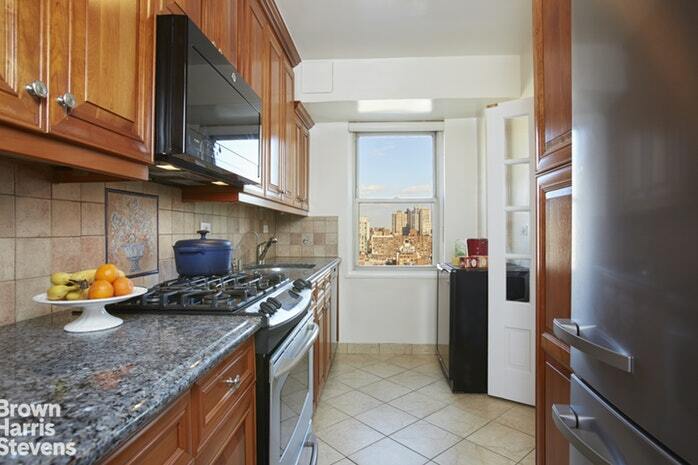 The roomy windowed kitchen is large enough for a hightop table and stool, has solid custom cabinetry up to the ceiling and offers stainless steel appliances including a brand new Miele refrigerator. The tile backsplash, beveled grey and black granite countertops and tile flooring have a soft Tuscan feeling that is warm and inviting. 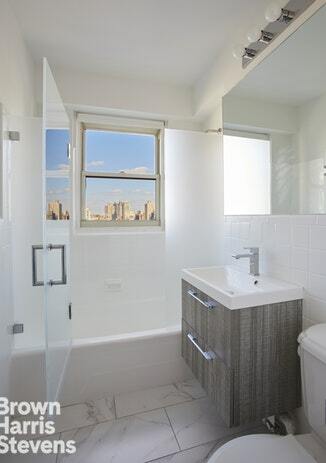 The newly renovated top-of-the-line modern windowed bathroom is bright, hip and beautiful. The large picture window and open view will make you feel like you are taking an outdoor shower! The foyer can accommodate an entry way cabinet or bench for keys, bags and mail. The Living room and Dining area are perfectly sized and flank the kitchen creating an easy natural flow through French doors from one room to the other. The floorplan is very flexible in terms of living room and dining room furniture placement. The large windows brings light into the entire apartment. 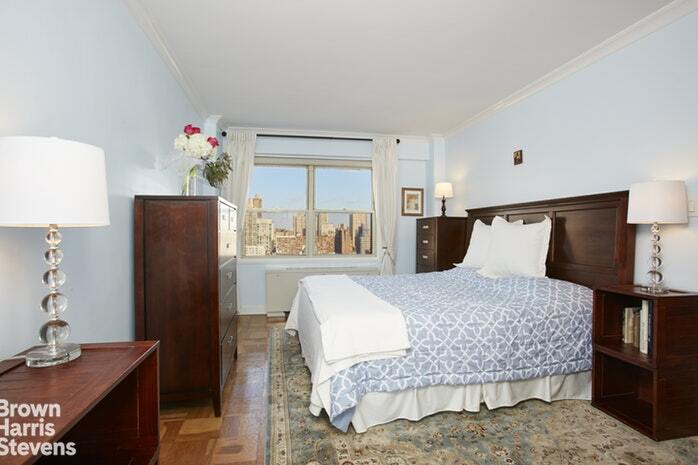 The master bedroom is quite large with two significantly sized closets, one of which is a large walk-in. The 2nd bedroom is also quite roomy with a useful desk nook. 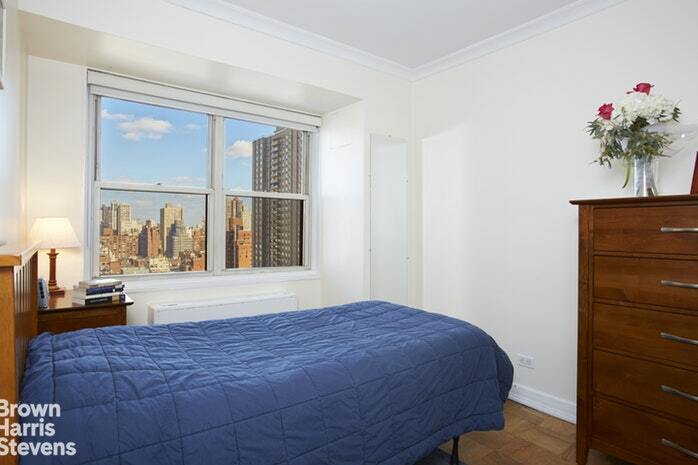 The living /dining rooms, kitchen as well as both bedrooms have stellar open views and receive beautiful light all day. The apartment is very quiet. French doors provide a stylish touch that partitions off the master bedroom suite from the rest of the apartment. 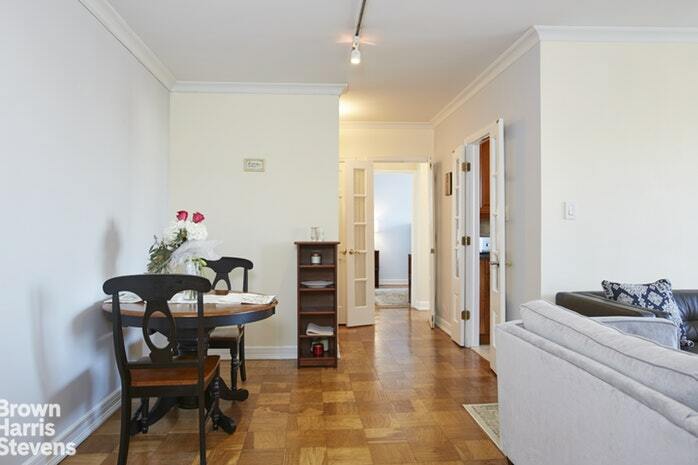 Wood flooring is in excellent condition throughout the apartment. There are many and unusually deep closets with custom interiors to enhance function and use. The building provides and controls the heating and cooling units. Light switches have dimmers. 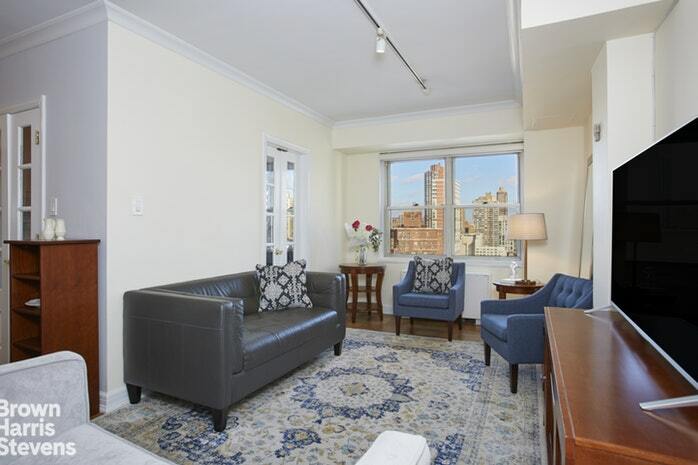 Built in 1962, 420 East 72nd is a highly coveted full-service welcoming cooperative in the heart of the Upper East Side. The lobby is staffed 24/7 with doormen and concierge services. There is a live-in resident manager and staff along with a responsive managing agent. The tasteful lobby and corridors were recently refurbished and add a finishing touch to this most respected cooperative. There are two elevator banks as well as a service elevator. While there is a common laundry room washer/dryers are permitted with board approval. The building has a roof deck and parking garage on the premises. Pied-a-terres, co-purchasing, guarantors and parents buying for children are welcomed. The building accepts pets and is wired for Fios and Spectrum. 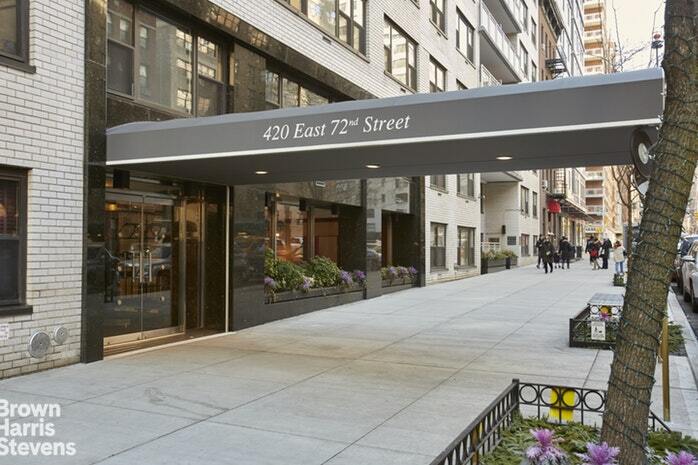 East 72nd Street is a beautiful wide street and the blocks around 420 East 72nd Street are replete with every service, store, and restaurant you choose to enjoy. Transportation, whether car, taxi or mass transit is at your fingertips.